The need for better bus service between Johnson and Wyandotte counties has never been greater. Wyandotte County residents want more service to reach thousands of jobs in Johnson County. And Johnson County residents want better service to reach the University of Kansas Medical Center campus where parking is scarce. Help is on the way. Both counties are partnering with the Kansas City Area Transportation Authority to fill a gap in transit service that will better serve the region’s transportation needs. Starting Jan. 4, the 107-7th Street/Parallel route serving the University of Kansas Medical Center area will be extended 3.5 miles south to the Mission Transit Center. 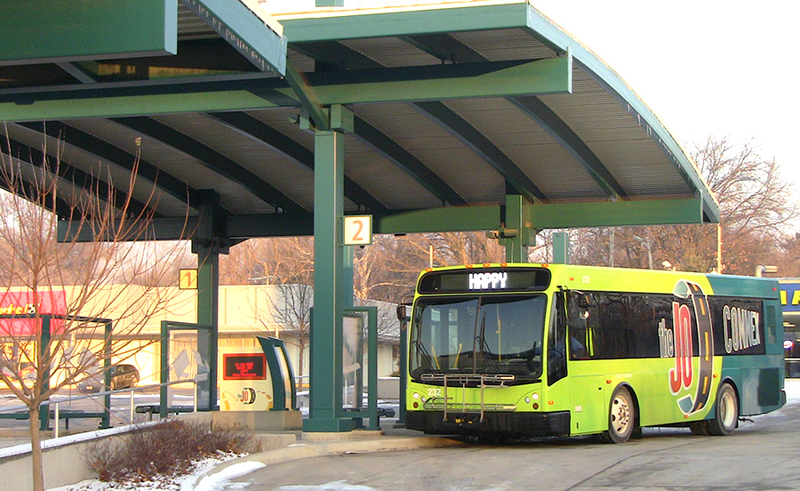 The Mission stop, located at 5251 Johnson Drive, is a jumping off point for riders to transfer to six other routes branching out to the rest of Johnson County. 107 buses will board at Stop 2 at the Mission Transit Center. Operating hourly each weekday, the expanded service will offer four roundtrips in the morning and four more in the afternoon between Mission and KU Med. Until now, transit access to the medical center has been limited from the Kansas side of the state line. Currently, there are only two, one-way northbound trips in the morning to the medical center from Mission and two, one-way southbound trips in the afternoon on the 667-Nall-Downtown. The expanded service will provide a major new regional connection bridging Johnson and Wyandotte counties using the medical center area as a hub. Attracting 26,000 patients a year, the University of Kansas Medical Center campus is at the epicenter of the 107 route, very near the Wyandotte/Johnson County line. The complex employs about 10,000 people, many who need but can’t access public transit. Of the 10,000 employees commuting to the medical center area each day, only 13 percent are directly served by transit routes feeding the area, the study found. Parking can be difficult, too, since there only about 5,000 parking spaces in the area. So better transit service would help, especially for the many KU staff, faculty, physicians and students living along the Interstate 35 corridor in northeastern Johnson County. The KCATA study found that Medical Center employees and students have a strong interest in using public transportation and other types of ridesharing, especially with so few parking slots. NEW schedules are available online.